Synthetic peptide corresponding to Mouse CAMKIV aa 127-143. Our Abpromise guarantee covers the use of ab3557 in the following tested applications. WB Use a concentration of 0.5 µg/ml. 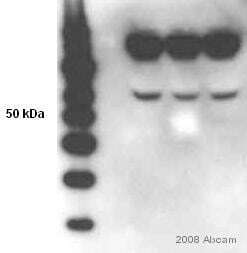 Detects a band of approximately 55 kDa (predicted molecular weight: 52 kDa).Can be blocked with CAMKIV peptide (ab5859). 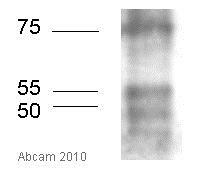 This antibody detects an ~55 kDa protein representing CaMKIV in HeLa cell lysate. ab3557 at a 0.5µg/ml concentration staining 55 kDa CaMKIV in rat brain extract by Western blot. Publishing research using ab3557? Please let us know so that we can cite the reference in this datasheet.